Wildland fire in 2.9 miles from the West Meadow Trail in Staunton State Park. The Park is being shut down. Elk Creek Fire and Platte Canyon Fire responding with mutual aid right now with a tactical engine. Firefighters have a line around the fire, found a water source close. 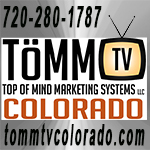 Platte Canyon Fire has been stood down. 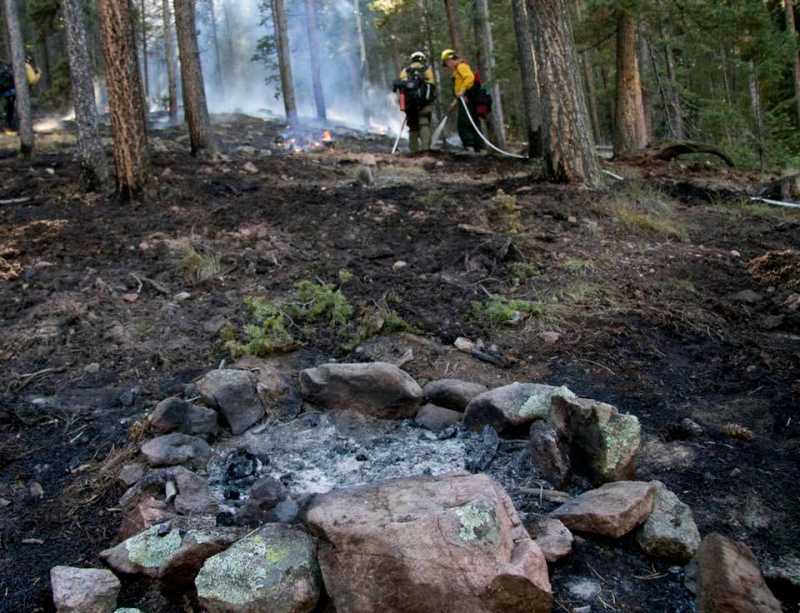 An illegal campfire at an illegal campsite started a half-acre fire this afternoon at Staunton State Park. 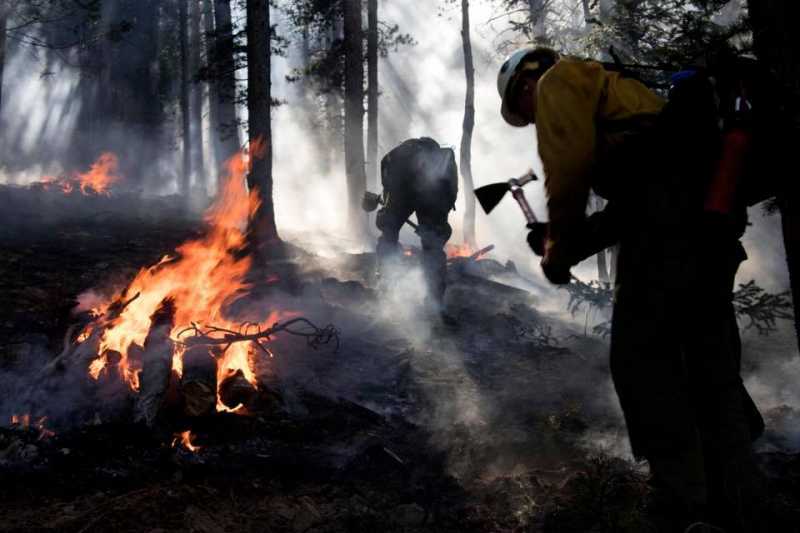 Firefighters from Elk Creek Fire were able to get 100 percent containment by 7 p.m.
Staunton has 25 hike-in campsites open to the public by reservation only. Fires, including charcoal, are prohibited. Elk Creek firefighters responded to several reports of smoke in Staunton State Park yesterday at 2:14 in the afternoon. 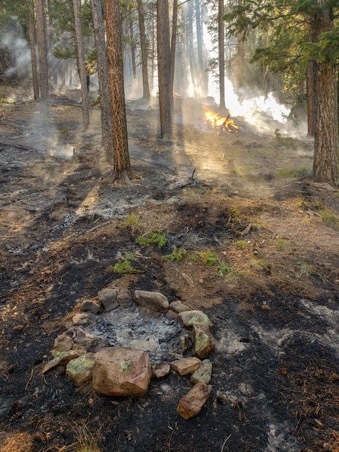 Firefighters found a .5 acre fire burning near the intersection of Marmot Pass Trail and Staunton Ranch Trail. The fire was contained by 6 PM. Firefighters will be out working on the fire today. The cause was an illegal, abandoned campfire. The park does not allow any campfires. Because there have been some comments made regarding camping in Staunton State Park, I wanted to make this clear that this has nothing to do with the hundreds of people who've obeyed the rules and camped safely and properly in Staunton's campsites. 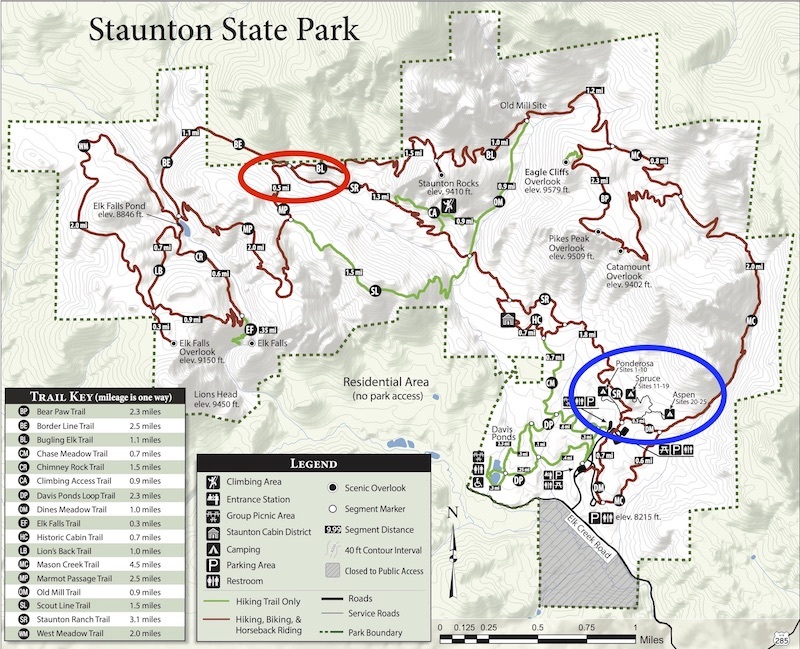 The map below is of all of Staunton State Park, nearly 4,000 acres, and the blue circle denotes where the designated campsites are while the red circle is where the fire was located - as you can see they are on almost opposite ends of the park. These people did NOT go through the campsite reservation system, they went rogue, camping where they weren't allowed in a remote section of the park and building a fire that was not allowed, period. Thank goodness for the hikers and bikers who saw the smoke and called it in, and for our park staff and fire departments for hustling to get there and put it out. Whether these people paid to get in or they snuck in, they showed a blatant disregard for the safety and well-being of our park, our residents, and our community. 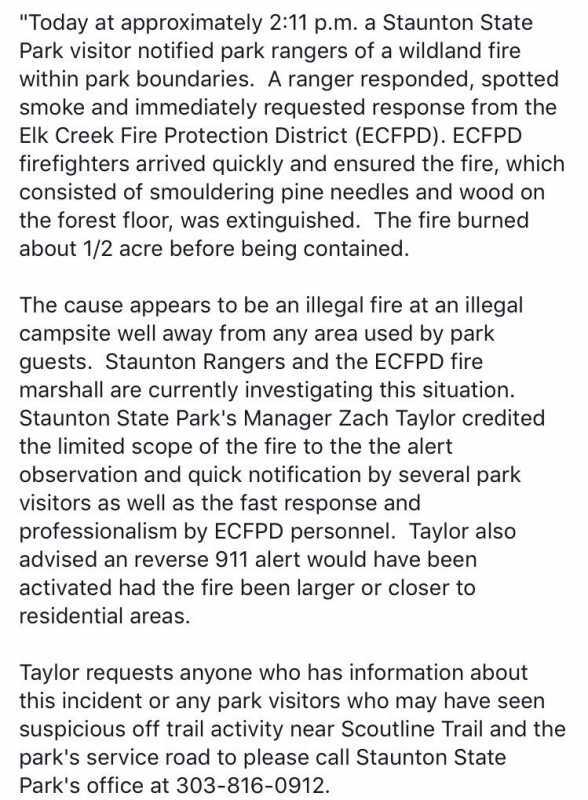 Aside from the fact that Jefferson County is still in Stage I Fire Restrictions, Staunton State Park has never allowed campfires within the park; it's too risky. If anyone has information on who did this, please contact the Park Manager Zach Taylor at 303-816-0912. Hello Louise, we absolutely understand your concern and are attempting to determine who was responsible for this careless and illegal action. The site of the illegal fire was miles away from our designated 25 fire restricted campsites in an area not designated for visitors. 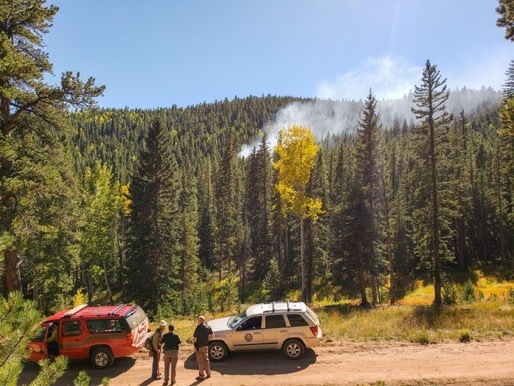 Thankfully, the park had on-duty rangers and staff, campers, hikers, equestrians and mountain bikers present to observe the fire immediately after it started. Their presence, recognition and immediate contact resulted in the fire being limited to 1/2 of an acre in size. We understand that our neighbors live here because of the area’s natural beauty and vast amounts of public lands and open spaces. 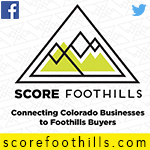 In fact, there are nearly 2 million acres of public lands in our vast backyard (Pike/Arapaho National Forests/Jefferson County Open Space/State lands) which attract thousands of outdoor enthusiasts daily. Unfortunately, some folks simply do not follow the fire bans, rules, regulations and laws and hence place others at risk. You can be assured that Staunton State Park’s Law Enforcement Rangers and staff are constantly vigilant toward the protection of our natural resources, the safety of the visitors and public whom they serve. 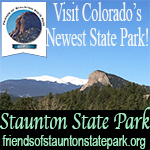 The staff members at Staunton are always on the lookout for those who violate park rules and regulations, fire restrictions and violations of Colorado Revised Statutes. 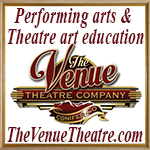 Again, thank you for your concern and we hope to see you visiting this amazing place.